Kate Lane, Amber’s tile specialist, recognises the importance of providing environmentally-friendly products to the Australian market. "There is often a negative perception associated with building or renovating a home and the generation of waste products,” she said. “Amber spends time researching and sourcing products that are either produced using ECO-friendly technologies, have a low environmental impact or use safe, raw materials. “Nowadays, there is often little-to-no difference between products which are manufactured with an environmental-footprint to those which are not. Amber is committed and will continue to provide our consumers with ECO products that are equal, if not better, quality than products that are produced with harmful technologies and materials,” she explained. Amber’s latest arrival in retaining walls, the Freestone ECO Retaining Wall system, is a sustainable, DIY vertical retaining wall manufactured with up to 40% recycled glass aggregate - a by-product derived from kerbside recycling. 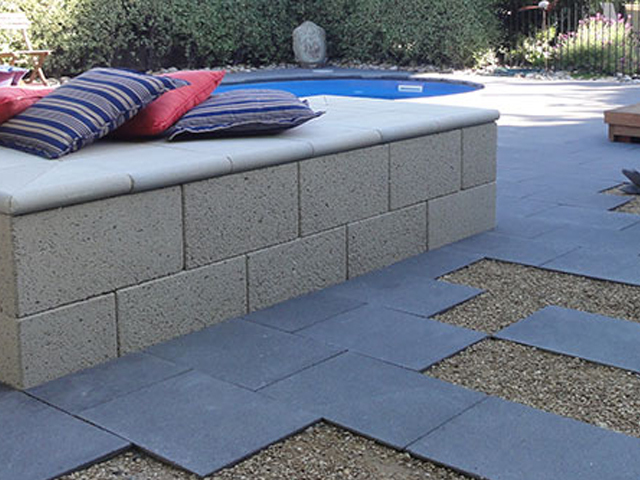 Showcasing a unique, smooth-surface finish that shimmers in the light, the Freestone ECO Retaining Wall system is available in three colours with bullnose or square-edge capping to accommodate every outdoor design and landscaping option. Phil Thurlow, Managing Director of Freestone ECO, explained that the environmental benefits of the Freestone ECO Retaining Wall system are extensive. “Naturally-resourced aggregates, such as sand and metal dust, are replaced in the manufacturing process by a recycled landfill product. Compared to other products on the market, there is a 40% decrease in natural resources being used in the production process,” he said. “Additionally, due to the cementitious value of the finely-crushed recycled glass, cement usage is eliminated by 10% automatically reducing CO² emissions while still achieving excellent product strength and quality,” he said. Amber’s DIY Freestone ECO Retaining Wall system is a step forward for a greener future. Amber’s new Atelier and Sunrock porcelain collections combine the latest in European trends with the durable-nature of porcelain. Perfect for use both inside and outside the house, the Atelier and Sunrock collections add sophistication and elegance to any home environment. Kate Lane explains that both collections are exclusively made in Italy using the highest-quality materials and boasting eco-friendly technologies. “The Atelier and Sunrock collections have received the international EcoLabel. This indicates that the entire manufacturing process has low environmental impact and uses environmentally-sound technology. “We can see from the nature of these products that the high- quality standard is not jeopardised because it is manufactured using environmentally-conscious practices, if anything it is better!” she said. Amber’s Resort collection allows renovators to create their dream water oasis while being environmentally-conscious. Using 100% recycled glass, the 25x25mm glass mosaics are available in nine bright colours - ideal for every Australian pool. Phil Miraglia, Amber’s pool mosaic specialist, said that the production process and materials used within the Resort collection make the product a perfect environmentally-friendly mosaic. “The advanced technologies used in the production of the mosaics focuses on minimising the overall environmental impact. 100% post-consumer recycled glass is the main material used in the production process further reducing the consumption of energy generated by 25% and producing zero emissions,” he said. Reflect your style, add a sparkle to your pool and reduce your environmental-footprint with Amber’s Resort collection. Amber’s Easy Lawn collection allows home owners to experience a lush, vibrant-green lawn all year round - no matter the season! Exclusive to Amber, Easy Lawn is Australia’s best natural-looking, synthetic-grass solution that is non-allergic and soft under your feet – ideal for busy families with children and pets. 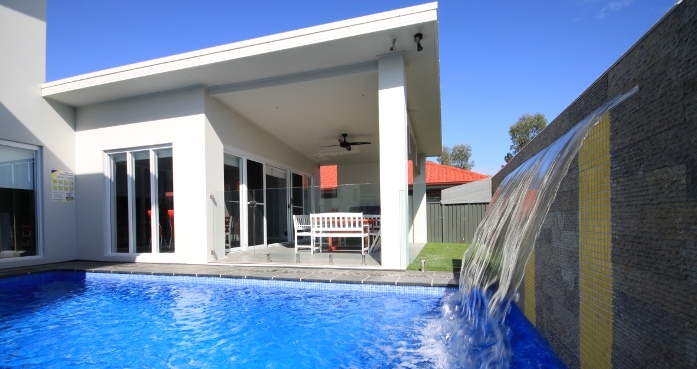 Offering a full range of synthetic lawn styles, Amber’s Easy Lawn enables home owners to create an easy-to-maintain, natural-looking outdoor area with less impact on the environment. Amber’s extensive range of ECO collections showcases a variety of environmentally-conscious products applicable anywhere within the home. Providing home renovators with the opportunity to reduce their environmental impact, Amber is the only place that brings it all together.